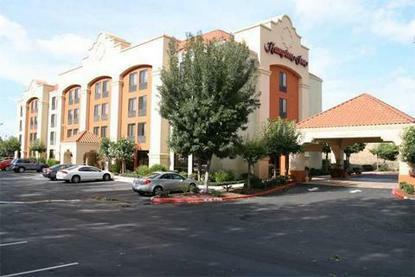 Hampton Inn Milpitas is located in the McCarthy Ranch area at the crossroads of the Nimitz (I-880) and Southbay (Hwy 237) freeways. Just minutes away you will find many Silicon Valley corporate headquarters such as Cisco Systems, KLA Tencor, and Maxtor. We are also minutes away from attractions like Paramount's Great America, Summit Pointe Golf Course, the VTA rail system and fine local restaurants. We feature 4 stories with interior corridors and 93 large, comfortable rooms in a modern, upscale environment and a convenient location with freeway access to all of San Jose's many attractions. Facilities include outdoor pool, exercise gym, business center, and safe deposit box. Amenities include complimentary Hot on the House Breakfast, 2-line phone, Free High Speed Internet in all guest rooms and lobby. We also offer large 27'' screen televisions with HBO, hairdryers, irons, microwaves, refrigerators, express checkout, guest laundromat, secretarial service, and laundry/valet services. In-room movies and rollaway beds are available for a nominal fee.